How Much Therapy Is Really Enough? Previous investigations of the dose-effect relationship in psychotherapy suggest that therapeutic benefits occur early in treatment. Approximately 25% of patients have been estimated to improve after 1 session, and 50% improve by 8 sessions. The aim of this study was to compare such estimates with the actual performance of outpatients in therapy. Forty-five patients seen at an outpatient clinic were monitored session by session for evidence of clinically significant change. Is Counseling Effective? Does Counseling help the client to cialis generique solve problems, reduce symptoms, and improve interpersonal functioning? The principle aim of this study was to estimate the number of sessions of psychotherapy needed for clients suffering from psychiatric illness to return to a normal state of functioning or reliably improve. For patients to return to normal functioning levels it was estimated that it would take about 8 sessions for 50% of clients to show reliable improvement and 21 sessions for about 85% to meet this criterion. 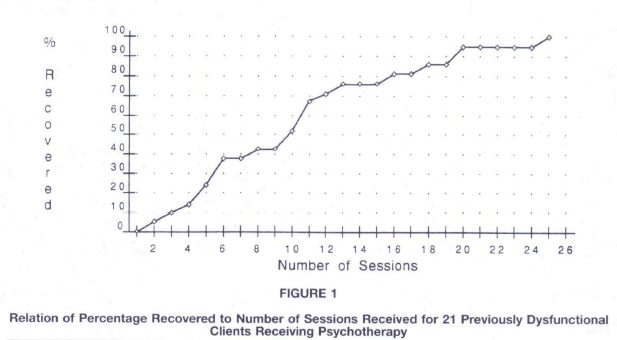 Recovery took more treatment, with 50% of clients estimated to recover after 14 sessions and 70% requiring 23. The findings of the current study are roughly consistent with those found elsewhere and suggest a minimum benefit should be closer to 20 sessions. A 2001 study published in the Journal of Counseling Psychology found that patients improved most dramatically between their seventh and tenth sessions.